The weekend is so close we can almost taste it—literally. Chances are you’re ready to devour some perfect poachies drowned in hollandaise sauce. Yep, we’re talking about everyone’s much-loved eggs benedict. And, the only thing better than a mouth-watering benedict, is a mouth-watering benedict with a decent discount. That’s right, we’re talking about ASB’s epic Brunch On Us. Devour brunch this weekend (or any weekend until the end of the year) and you’ll score 15% off your meal. Just pay with your personal ASB Visa credit card between 8am and 12pm and the discount is all yours—huzzah! For the full terms and exclusions, head to the bottom of the page. To give you some brunch-spiration, we’ve rounded up some of our fave local cafes. 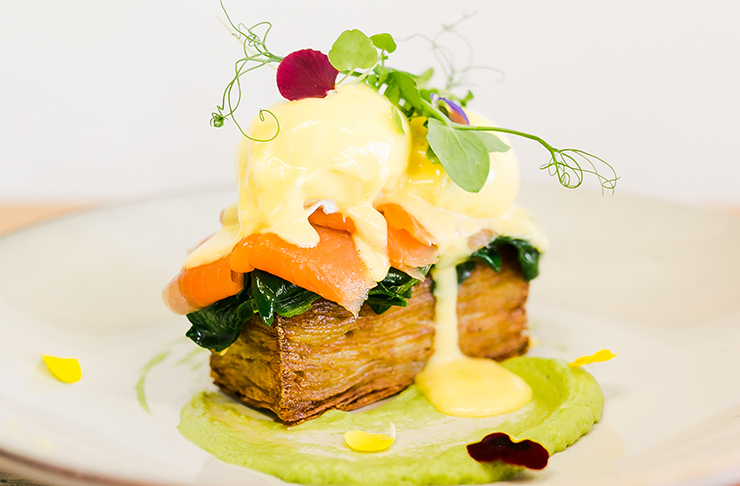 These Auckland gems are known and loved for the best eggs bene in town. Happy brunching, y’all! While we’re big fans of Winona Forever’s classic bacon bene, today we’re here to sing the praises of their prawn bene. Known as “The Ladyboy”, the dish has a delicious Thai twist that’s worth raving about. Say hello to chili brioche topped with deep-fried prawn and smothered with tom yum hollandaise. Add this “same same but different” benedict to your weekend brunch hit-list. Rosebank Coffee & Kitchen go over and above to whip up some of Auckland’s finest café fare. And, trust us when we say, their eggs bene is no exception. Served on potato hash, the dish showcases free-farm bacon and perfectly poached free-range eggs. 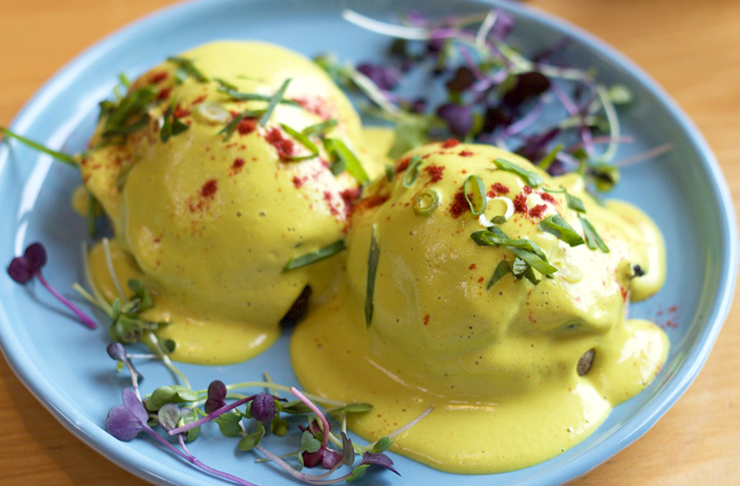 The not-so-humble bene is then paired with vibrant chimichurri and lashings of saffron-infused hollandaise. FYI save room for one of the café’s signature cream doughnuts. When it comes to eggs bene, Geeks On Sainsbury sure know their stuff. The delicious (and beautiful!) brunch stars delicate layered Agria potato, bright beetroot puree, sautéed kale and Pokeno bacon. There are also the options of smoked salmon or pan-fried tofu—the latter is an Urban List fave. Better yet, Geeks On Sainsbury caters to those with smaller appetites with a petite (aka one egg) options. The Block Cafe don’t do their waffles by halves. Order this bad boy and you’ll be delighted to discover it comes with fried chicken. Yes, fried chicken. We’re talking house-made muffins topped with the usual suspects (spinach, hollandaise and eggs) as well as finger-licking, mouth-watering fried chicken goodness. Ditch the diet and head to Blockhouse Bay pronto. Auckland’s reigning bagel champs (aka Goodness Gracious) know a thing or two about a decent bene. Served on a New York-style bagel, you have the option of crispy bacon, smoked salmon or a vege-friendly option. It’s then paired with poached eggs, spinach and the all-important hollandaise. Sometimes you really can’t go wrong with a classic and this is that perfect classic. Turning vegan doesn’t mean giving up your love of benedict. Pop into Little Bird’s Unbakery where you’ll be treated to a plant-based bene that’s just as good—if not better—than the eggy alternative. You’ll be served a raw, seeded bread bagel topped with wilted greens and mega Portobello mushrooms. However, the real magic is the hollandaise. It’s made with cashew, turmeric and a whooole lot of delicious, nutritious goodness. You can’t say you’ve brunched in Auckland until you’ve checkout Herne Bay hotspot Dear Jervois. Brunch your way through matcha waffles, Nutella pancakes or—you guessed it—an epic benedict. The power is in your hands with a choice of salmon or bacon with sautéed spinach. As for your vessel, choose between sourdough or a house-made potato rosti. Wash down with an ever-popular smoothie and you’re away laughing. Bringing bene goodness to The Shore is Takapuna’s Honey Cafe. The unmissable dish is all about potato croquette, baby spinach and beetroot puree. Go all out and opt to add wild mushrooms, bacon or salmon (smoked or cured). Oh and while we’re at it, Honey Café’s chicken salad with halloumi, mango and avo is also divineee! Recruit your BFF and devour both dishes for a mouth-wateringly good brunch. I guess that’s your weekend bene sorted then, right? Pro tip: don’t forget to pay with your personal ASB Visa credit card to score 15% off.